Do you have great ideas but struggle to express them clearly, convincingly and concisely? Do you never manage to make girls feel comfortable around you when you talk? If you speak with a tone that suggests you don’t belong in the room, you will start to experience frustration with the number of closed doors you see. Knowing how to speak confidently isn’t solely crucial for the world of dating. Confident communication can get us through the most trying of times: job interviews, long meetings, and presentations, arguments that could escalate, even awkward family dinners. If you know how to present yourself, it becomes a social skeleton key that you can use to handle any situation. Speaking with confidence natural once you master it. You will soon find yourself enjoying and getting the most out of your encounters again. Before you work on your tone of voice, you have to get familiar with confidence. I have been helping people relocate their self-esteem for over a decade now, and none of them were born with it. If you want other people to see the effects of the confidence-building process, such as in your speech or body language, you have to commit yourself fully. Go to the gym, spend time following your passions, read more, or go for that long-overdue next step at work. Challenge yourself, and meet those challenges head-on. 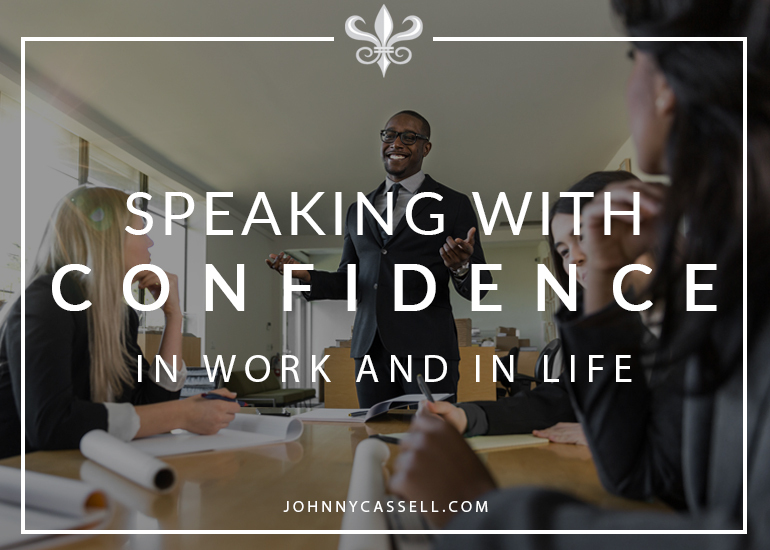 I could teach you all the gesticulations and vocal tones under the sun, but the most efficient method as to how to project confidence is simply to become confident. That takes time and the constant smashing of personal and social barriers. That also means putting yourself forward for activities or tasks you may not usually do, like giving a group presentation or training a bunch of newbies. If you volunteer yourself, you will tackle the task with more gusto than if you are picked. This will come across in your vocal tone. This applies more to the need to speak with authority at work, or in situations where you have authority and need to exert it. Naturally, the more you know about a topic, the more confidence you will have when you speak about it. Having a sound knowledge base is key to doing a job right, and the way to sound confident and professional when discussing your field. If you’ve searched for this article, I can only imagine you care enough about your job to want to sound authoritative and confident when you step through the front door of the office. Make sure that your knowledge is up to scratch and you keep a more than a fleeting eye on industry news. The other important thing to know is your limits. Nobody knows everything and even fewer people like a know-it-all. If you don’t know much about a subject, but start talking at great length about it and it’s not long before you’ll start faltering. If you’re meant to have prepared something, prepare it. If you’re applying this to the world of dating, know what’s great about you before going into a room and avoid waffling on about topics you don’t understand just to impress someone. They will have a far greater appreciation for a man who gives off the impression that he loves who he is and what he does, and has gone out of his way to know as much as he can about it. Your posture is key not just for communicating confidence via your body language, but also changing the sound of your voice. Breathing becomes hugely important in maintaining your posture. Breathing with your diaphragm, for example, lengthens the chest cavity, containing the lungs, to full stretch. Accompany this with pulling your shoulders back and keeping an upright gait when you walk and you will find that your voice is more resonant than it used to be. Posture is also crucial for upholding authority. Regardless of what it does for your voice, if you are speaking with strong, straight posture, it gives you words far more credence and presence. Remember: there is no point speaking if the listener feels that they don’t have a reason to listen. Keeping your chest out and your shoulders back will give the recipient of your message confidence that they should be looking to you on this particular topic. Controlling hand gestures is one of the most difficult parts of learning to speak confidently. You have to unlearn quite physical tics that accompany speaking when you are not comfortable. This can include leg-jiggling, playing with your hair and face, grasping one hand with the other, rubbing the skin on your arms, or even using your phone (as a habit, not out of necessity). These make you look nervous and uncomfortable, but a gesture can also mean many different things in different cultures, and you run the risk of offending someone. This seems trivial, but if you work for an international company and need to speak confidently at an overseas conference, it’s worth bearing in mind. Calm, open gesticulation to emphasise key points is all that is needed. If you are out talking to girls, however, you may not mind getting a bit animated with the body language. It shows that you are engaged in the conversation. The approach is in a less formal environment so requires less control and preparation. Even animated gestures need to come from a basis of calm, confident body language. This foundation comes from the very first point of the article; invest in yourself, and you will feel amazing. It will show. The most important aspect of vocal tone to think about is when to use it. We often mix the formal and the informal. This can cause problems when we are trying to sound authoritative in a casual social environment or be too light and relaxed when a firmer stamp of authority is required. Reading a situation can feed how you shape your vocal tone. That includes the pitch of your voice as well as the pauses and the emotion behind what you’re saying. However, as a rule, you should be speaking from your diaphragm, using deeper breathing, which should make your vocal tone deeper, richer, and more authoritative. If you also smile, this will sharpen your consonant sounds and brighten your vowel sounds. You should approach women smiling as widely as you can. You will not only appear warm and friendly, but this will naturally make you sound more confident during the ensuing conversation. I hope this has helped you learn how to be more confident while speaking. The key to confident speaking is practice. For further information on a more in-depth, tailor-made journey to your core confidence, visit https://www.johnnycassell.com/pua-training.